This photo was taken by a motion-activated hunter's (Rick Jacobs) camera in Pennsylvania's Allegheny National Forest (US). It has sparked some heated debate. Could it be the legendary Bigfoot? Mr. Sasquatch himself? Or is it a bear with a skin disorder? Or is it my ugly little brother out trapsing after dark like we've warned him not to do? Igor has let me use several of his photos. In appreciation of his generosity, I would like to call upon you arachnophiles to help him identify this spider. Anybody got a clue as to what it might be? I'm seeing some long, prickly legs, oversized mandibles, and evil, beady eyes. I know, that sounds like most spiders, but those colors on the abdomen look like the hallmark of the [BLANK] spider, wouldn't you say? Come on people, don't let me down. Here's some new fodder from one of the most gifted wildlife photographers on the web, Igor Siwanowicz. He noticed my dearth of Damon variegata postings, and forwarded these photos to me. 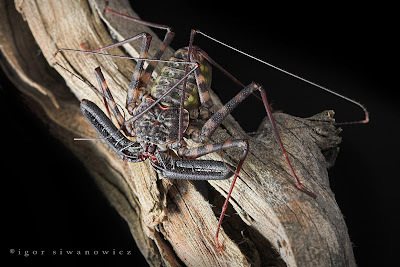 Check out some of the best pictures of Tanzanian tailless whip scorpion you'll ever find. For you invert lovers, these sideways-walking arachnids make for great pets, even for beginners. They're mild-tempered and can get to a size of over seven inches. 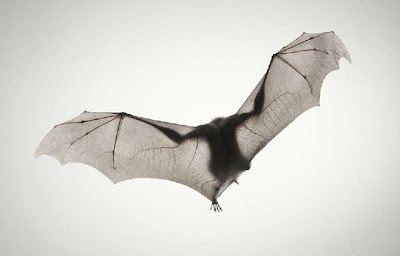 For the rest of us, we can sleep easy knowing that they are harmless and are only found in Africa (unless you live next to an invert lover who doesn't keep proper lids on his/her terrarium...). 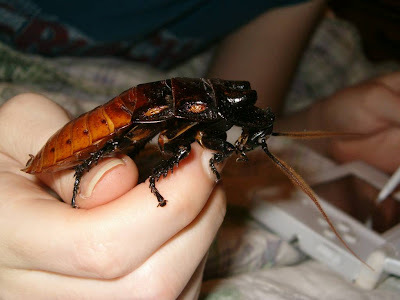 And for those of you who haven't eaten yet, Fear Factor taught us that these critters make for good eating! 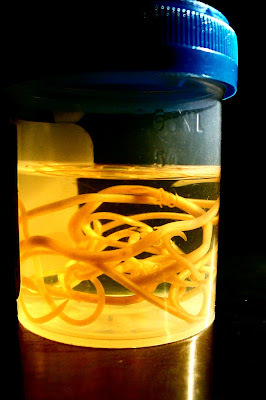 You're looking at the adult worms of the Toxocara family, who often take up residence in the small intestines of dogs and cats. 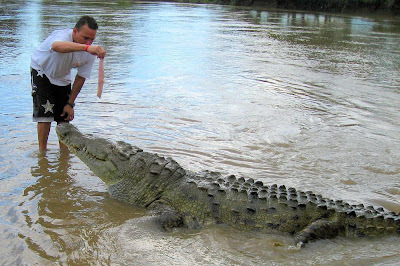 They range from 4-12 cm in length. This parasitic worm represents just one more reason why you should steer clear of your pet's rear end: you can get infected, too. The larvae will penetrate your bowel wall and migrate through your blood vessels to reach your liver, muscles, and lungs. It might even penetrate into your eyes and brain. I'm not saying you need to evict your dogs and cats. Quite the opposite. I'm just saying that you need to keep take care of them. And don't play in the litter box. My wife cannot see this post, not if I am ever want to have a dog. Thanks for the link, Ida. You're jeopardizing everything. Behold the goosefish, which belongs to one of the my favorite groups of fish--the anglerfish. The goosefish is known for being wide and flabby, and can get up to six feet in length and weigh 75 lbs. That's a big fish. 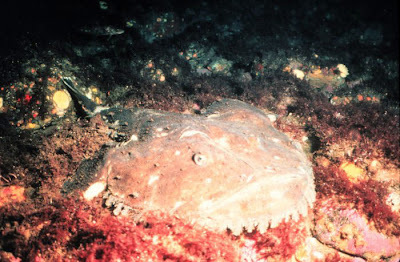 But then, the taxonomy of goosefish isn't so easy, since there are several varieties of them. Ugly can come in oh-so-many shades. 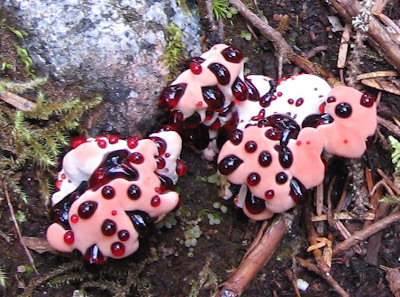 1) Bleeding: they ooze a red liquid. 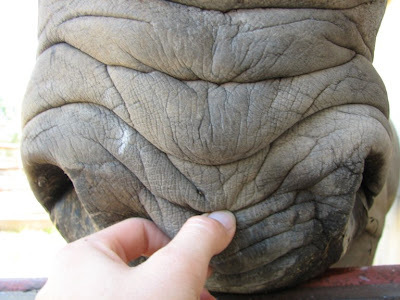 2) Tooth: they grow little 4 mm teeth on their underside. 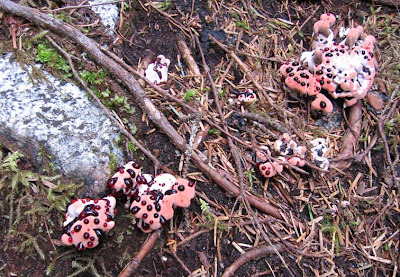 3) Fungus: it's a mushroom. You really can't ask for a more appropriate name. I probably should have saved this post for Halloween, but I couldn't resist. Thanks for the photos, Kelly. I feel a little bit sick now--my world just got a bit more disgusting. Cynthia sent me these photos that an intern (by the name of Karla--thanks Karla) took while at the Fossil Rim wildlife park in Texas, US. 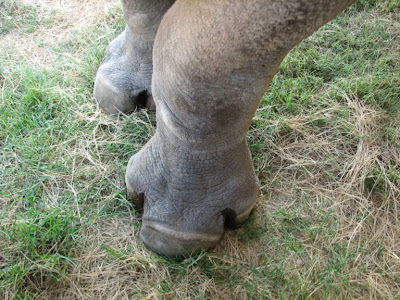 They are of a black rhino named Kusamona. Karla calls him her 'lovebug,' and says, "who knew rhinos were really 2000+ pound black labs in disguise?" I never knew that rhinos could be so...loveable. I'll have to look past the thick hide, beady eyes, and armored plates to see that trait, but I'm sure it's there. I'll just look from the back of a jeep and at a great distance. 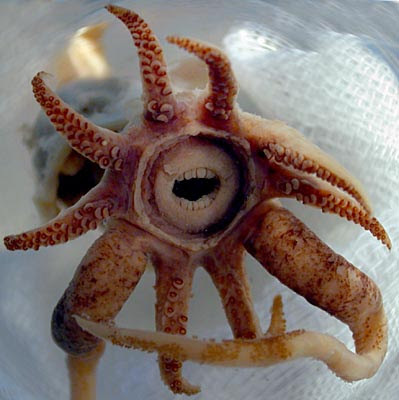 You're looking into the face/maw/undercarriage of Promachoteuthis sulcus. It's hard to find any information on this squid, but Heather, our resident cephalopodophile, has provided us with a wealth of photos. 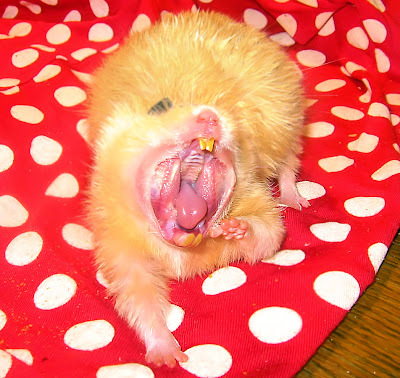 I'm not sure what that hammy grin is all about, or what those teeth are meant to chew on. I'm guessing apples and acorns are off the menu, though. Thanks for the links, Heather. It would seem that trawling the depths of the Tree of Life website can yield some amazing results. 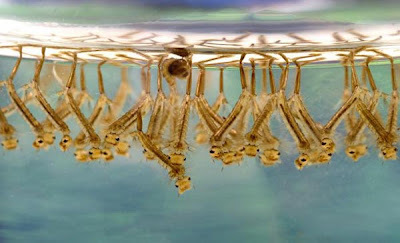 I'll never forget my first encounter with mosquito larvae. It was summer, and I was out back staring into our goldfish pond (I did this a lot as a little boy). I saw these little squiggly things squirming their way about the water and hanging just below the surface. Then, much to my horror, one of my goldfish swam by and swallowed several of them. I was mortified (and a real softy). Had I known that those squiggly things were the dread offspring of the nasty little creatures that left itchy bumps on my legs, I would have rooted the goldfish on. These photos come from Booge. As Booge put it, "They give me a case of ick right in the back of my throat." I second that bile-induced sensation. Chris sent along this story of a fisherman who was fishing in the Cayman Islands. The fisherman saw something bobbing in the water and motored over. This is what he found. What you're looking at is a case of the small fish eating the big fish. 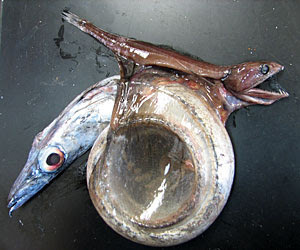 More specifically, a Great Swallower (a small fish known for taking on big prey) that tried to swallow a snake mackerel four times its size. It didn't go so well for either fish. But, if it is a consolation to them, they are contenders for the official Guiness world record of the largest portion eaten by a fish. I'll be tightening my belt now. And I'll forgo the trip to the all-you-can-eat buffet I had planned for tonight. I think a small bowl of rice will suffice. Thanks for inspiring me in my new diet, Chris. Please, for my own sanity, tell me that this image has been photoshopped. I'm not sure I can live in a world where these fly around at night. I'm already afraid of spiders, giant land crabs, standard poodles, and naked mole-rats. I don't want to add demon bats to my list. 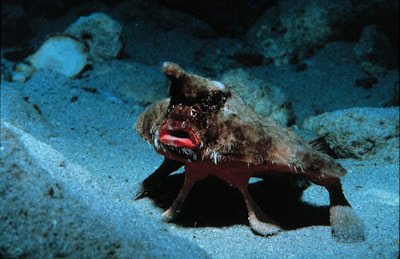 This little red-lipped batfish is posing to intimidate. But I wonder what kind of advantage those red lips offer it. Do they aid in feeding, or serve as some warning to would-be predators? The last time I tried to go around wearing red lipstick, I was given a lot of...unsolicited...attention. But then, the ocean floor is a different environment from the downtown mall after dark. Thanks for the link, Ida & Fredda. Will is living out a personal nightmare of mine. 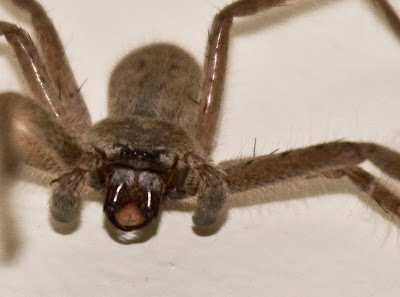 The arachnid below, a Huntsman spider (sparassidae isopeda vasta) by the name of Claude, has taken residence in his bedroom. 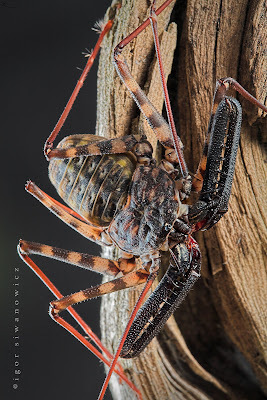 These Australian monsters are **supposedly** harmless, but they can get to a legspan of up to 4 inches! 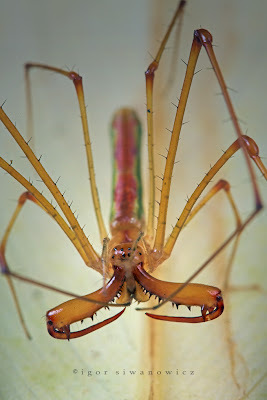 That makes for some large mandibles and long legs, which makes for me screaming like a little child. Jenny sent in this photo of Sue Ling Fey, her Shih Tzu. While no dog looks particularly attractive when bathing, Sue adds a certain amount of charm to the event. Did you know that the Shih Tzu is a Chinese breed? They were bred during the reign of Empress Dowager Tz'u Shih (hence the name) in the 1800s. Well, now you do know, and you can go into the weekend with one more bit of trivia with which to wow your party guests. Thanks for the photo, Jenny. Ida sent this photo along. You're looking at the profile of photis pugnator. Pugnator. I'm pretty sure my siblings used to call me that. 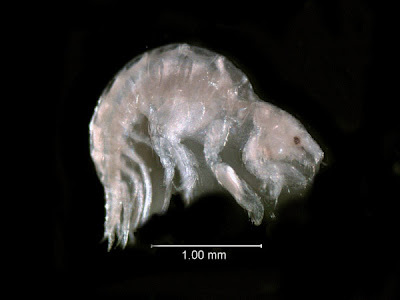 These tiny creatures are tube-building amphipods. 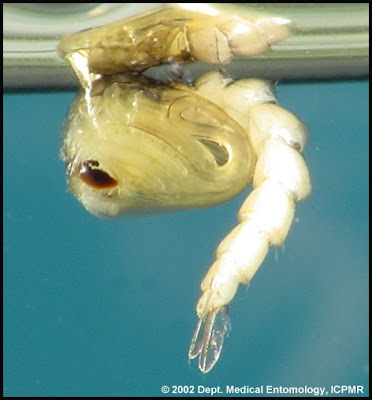 Amphipods are crustaceans known for their laterally compressed bodies. Think sea lice and sand fleas. Isn't that an illustrious corps of critters to belong to? Thanks for the photo, Ida. I hadn't received my yearly dosage of amphipods yet. 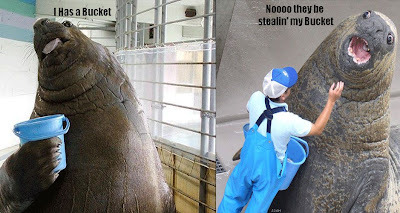 Here is my final ode to the departed Minazo (elephant seal housed in Japan for more than a decade). You'll have to click on it to get the full effect. We do some very odd things to our animals. And seldom do the animals in question enjoy what we do to them. The following photos illustrate just that. 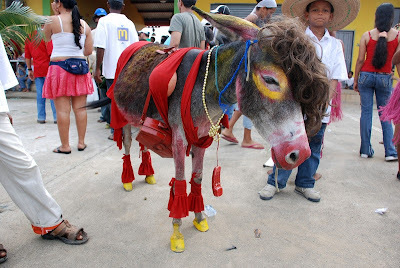 I never thought a dressed-up burro and a painted Chinese Crested dog could have so much in common. Wendy sent me this photo and link of the hooded seal. 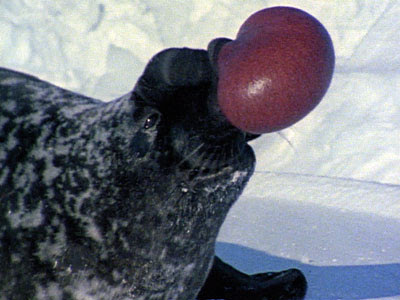 This arctic pinniped is normally an attractive marine mammal. But they have a neat party trick: they can blow a red balloon out of their nose. I wish, I wish, I wish I could do that. I'm reminded of the anglerfish here. I wonder if the air bladder is meant to be a lure to would-be prey who like to dine on over-sized kidney beans. I've heard the occasional rustling in the ivy that's overgrown by backyard fence. When I've gone out to investigate the noise, I am usually greeted with the green reflection of a pair of possum eyes staring at my flashlight. But if I caught a glimpse of this eating from my gnarly-fruit tree, I'd call my realtor the next day and relocate. I've borrowed this aye-aye shot from the good folks over at Zooillogix. 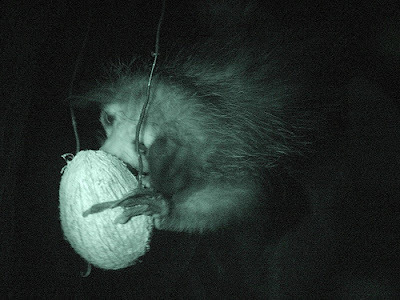 In their post, they write about a scientist who believes he may be coming close to proving that these nocturnal primates are able to see in color in the dark. I really hope they can. I'll be the first in line to purchase the first commercially available set of aye-aye night vision goggles (I would call them the Aye-Eyes). Thanks for the link, Casey. 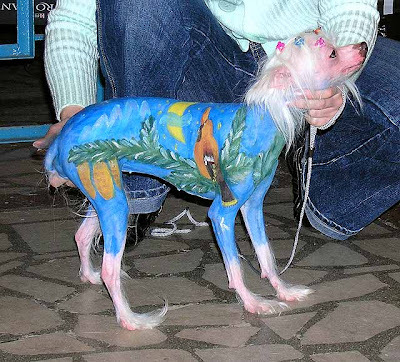 I hesitate to post these photos, because I don't think this dog is ugly in the slightest. But a lot of you seemed to enjoy my last post on Clifford the Leonberger, so here's a follow up. As you can see, this pooch is a dominant player in Douglas's household. And he enjoys video games as much as the wife and kids. 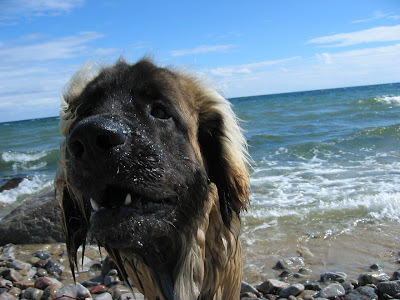 The Leonberger now weighs in at 178 lbs of pure muscle. Combine that weight with its leonine coat, and no wonder he is impervious the the Swedish cold. Thanks for the photos, Douglas. 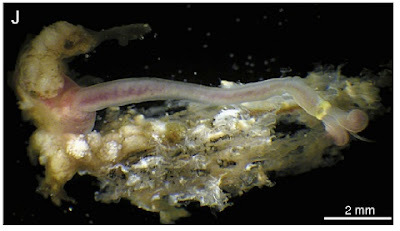 One of our resident ichthyologists, Rasmus, has sent this article to us as a follow-up to the horrific toothpick fish (of nether-region-parasite fame). No, this isn't a shot from the Hubble telescope. Rather, you're looking at a seemingly inocuous oceanic worm. I ask you, does this worm bother you? Did I mention that it is a bone-eating worm? If you were a whale (its prefered host), you wouldn't like them one bit. These are nasty little parasites. Fortunately, they are tiny. But here's a bit of cosmic come-uppance: the males are super tiny and actually are parasites to the much larger female! In fact, any given female might be host to a veritable harem of lesser males. How is that for social engineering? Thanks for the link, Rasmus. I'm going to go burn some incense at the base of my whale totem now. Ida sent me this amazing article by Time. It is a photo essay that features 14 magnified shots of commonplace bugs. 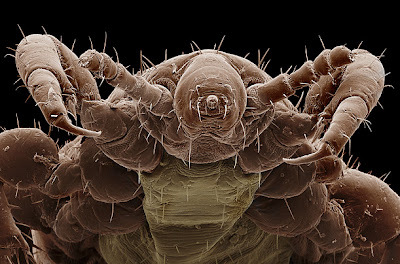 Like Ida, I was most struck by the human head louse. I recommend perusing all the shots. You'll walk away from your computer scratching and swatting at every itch and twitch you feel. You're welcome. 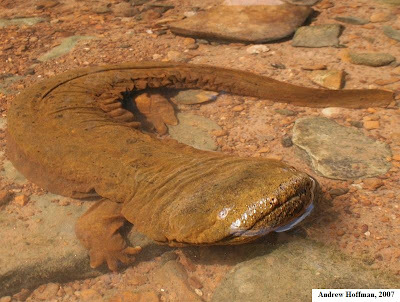 My post about mudpuppies elicited quite a bit of debate regarding the difference between mudpuppies, axolotls, and (my new favorite) the hellbender. I was able to locate a masterful herpetologist on Flickr, Andrew Hoffman, and secure his permission to use the photos below. He was also quite forthcoming in the aforementioned debate. 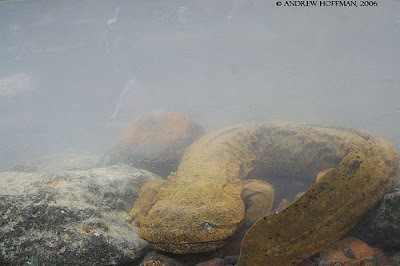 Behold the bona fide Eastern Hellbender (Cryptobranchus alleganiensis alleganiensis). Any amphibian that can eat a crawdad is all right in my book (not that a creature called the Hellbender needs any approval from a second-rate blogger like me). Thanks for the photos, Andrew. Your skill at photographing amphibians is second to none. Connie is a dutiful mother and enjoys teaching her children about life and the world around them. 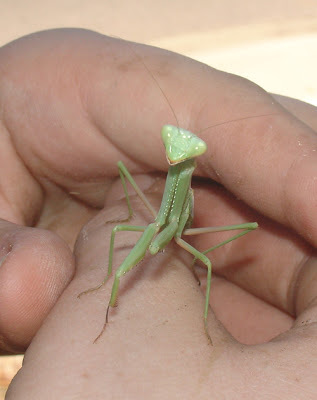 So, while outside gardening one day, she was very pleased that this praying mantis decided to drop by to be a guest lecturer for that day's lessons. No doubt the kids enjoyed being able to interact and marvel at one of the coolest insects around (and mantids know they're cool, which kind of annoys me). 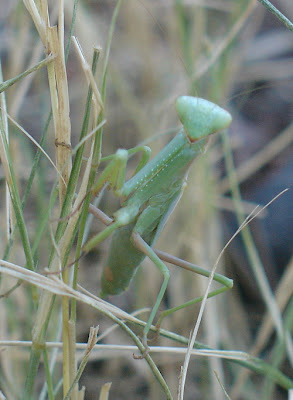 I just hope that during the lesson that the mantis didn't bring up the whole mating ritual where the female bites off the head of the male. That kind of material should be reserved for high school on up. Thanks for the photo, Connie. I'm sure this man is a good guy. I'd probably enjoy having lunch with him. I have nothing against him (he has rockin' shorts, too!). But sometimes, deep down inside of me, in that cruel place of my brain that I keep locked down tight, I find myself rooting for the crocodile. The world just got a bit less ugly, and that is a sad thing. Kate sent me this article, which tells the tale of the passing of Japan's largest seal, Minazo, who entertained crowds for 10 1/2 years. I've posted on this pinniped in the past, not knowing the details. Now we know who he is and can give him his dues, even posthumously. Everyone say goodbye to Minazo. May he be greeted with more mackerel in the Hereafter than he could ever feast upon (Minazo heaven = mackerel hell). Thanks for the link, Kate. P.S. I love the titles. 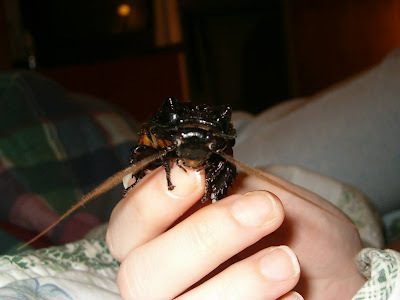 Say hello to Bison the hissing cockroach. This beast recently matured in one of Jade's colonies. It measures in at 3.5 inches long by 2 inches wide, with 1/4 inch horns (ergo the name of Bison). I assume that a hissing cockroach of this size does more than hiss. I'm imagining something more of a roar. BTW, that is Jade's better half, Rachel, holding the roach. She has more chutzpah than I do, no doubt. Thanks for the photos, Jade. Keep tabs on this one, lest he should run rampant in Tokyo and contend with Godzilla. I've been lobbying my wife for some time to consider adopting a small pet for our kids. She's adverse to anything that will require too much maintenance or commitment (I can understand that--our kids require a lot of maintenance and commitment). But then I took her by a cage full of teddy bear hamsters. Now she's considering the possibility. I'll ask her not to check out this blog for the next week or so. This open-mouth shot will undo the ground I have gained in this debate. Thanks for the link, Kat. Everyone congratulate Sgorby. 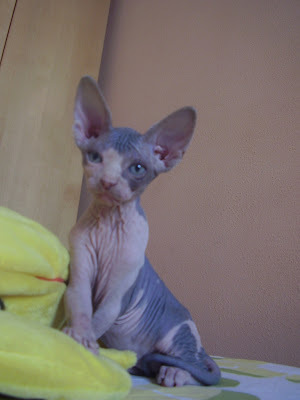 He is the proud new owner of some Sphynx kittens. 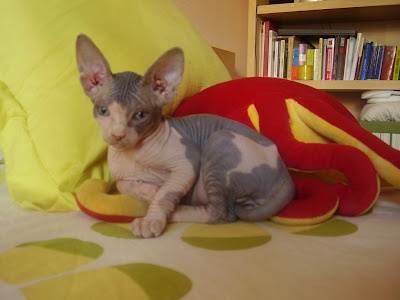 I've featured these hairless felines many times before, and intend to do so in the future. 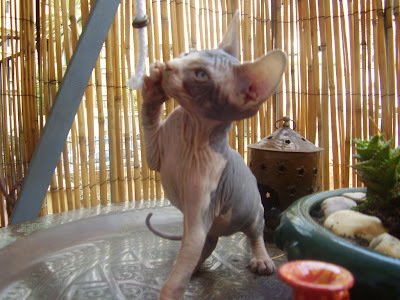 But these kittens pass the ugly test on a mere technicality (hairlessness secures their place). They are so darned cute. Thanks for the photos, Sgorby. Meet Douglas's dog. 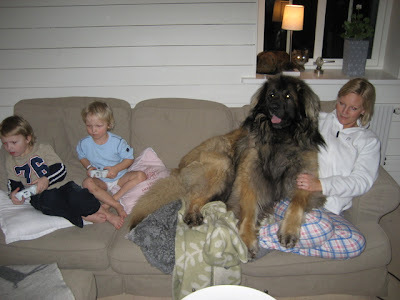 He's of the leonberger breed, and is a resident of Sweden. He enjoys beaches and fishing. 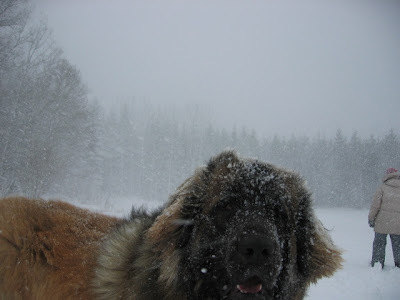 Here's an interesting tidbit: the leonberger was established in 1846, in Leonberg, Germany. They are the result of crossbreeding the Newfoundland, St. Bernard, and Great Pyrenees Mountain dog. I must admit, I am very jealous that someone thought of doing that first--to take three of the largest canines known to man and breed them into a super dog. I wish I could shake Heinrich Essing's hand (the breeder--but that would be weird, since he is dead). I imagine you'd have to have some pretty sizable facilities to accommodate that kind of breeding regimen. Thanks for the photo, Douglas of Sweden. I'm always impressed when a pet owner is secure enough to submit their beloved beast to Ugly Overload.